Can I Substitute Beet Juice for Red Food Coloring? 2 What Makes Food Coloring Darker When Baking a Red Velvet Cake? 3 Can I Change the Color of Rolled Fondant? Used in everything from trendy red velvet cake to Valentine’s cookies with pale pink frosting, red food coloring adds strong visual color to baked goods. Although the U.S. Food & Drug Administration has deemed that artificial food colorings are safe, some people feel it is healthier to avoid chemical food additives whenever possible. Beet juice can easily be substituted for commercial colorings to provide an all-natural punch of color to many foods, but not all. Beet juice works as a natural food coloring for dishes where a dilute purple-red will look fine -- but if you need a bright red hue, go for regular food coloring. 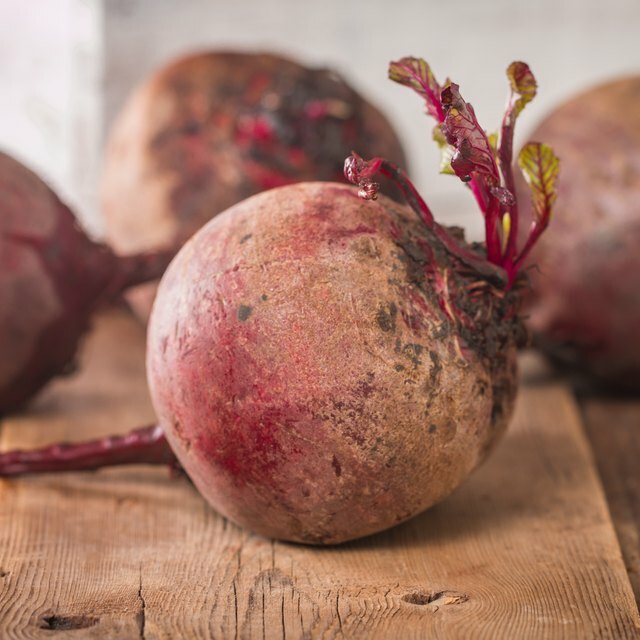 Beet juice imparts little or no flavor to foods, so it can be a better choice than other natural red food colorings with strong flavor profiles, like cranberries and raspberries. Home cooks should note that the red color created with beet juice is a bit more purplish in tone than commercial red dye. Beet juice can be used in similar quantities to artificial coloring. Add anywhere from about ½-teaspoon to 1 tablespoon of beet juice to foods, depending on the color desired. The more juice used, the darker the resulting color. To mix pale pink icing for cookies or cupcakes, for instance, proportions of about half beet juice to half water should be used. Lovers of red velvet cake may be better off using commercial food coloring. This popular treat is actually a devil’s food cake with red food coloring added to dye the cake bright red. Most recipes generally call for large amounts of artificial food dye -- up to 2 tablespoons or more -- to achieve this distinctive color. Getting comparable results with beet juice is tricky, because the juice turns brown when exposed to non-acidic cake ingredients like baking soda and processed cocoa. While it’s possible to make a traditional-looking red velvet cake using beet puree instead of juice, the amount of cocoa must also be reduced, so the resulting cake has a less intense chocolate flavor. One way to make beet juice for food coloring at home is to cut up a few raw beets into chunks and cook them until soft in a small amount of water. Strain the resulting ruby-red cooking liquid to use as coloring, and reserve the cooked beets for another use. Another method is to force shredded, raw or cooked beets through a strainer or cloth to give up their juice. Well-equipped cooks can also put beets through a countertop juicer. Beet juice stains, so be careful to protect countertops with a piece of plastic or a sheet of newspaper, and cover clothing with an apron. If making beet juice from scratch seems like more trouble than it's worth, commercially prepared beet juice can be purchased from a health food or specialty store, although these products tend to be somewhat expensive. Alternatively, the juice from canned beets can be used. U.S. Food and Drug Administration: How Safe Are Color Additives?